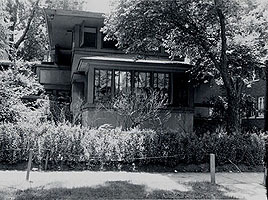 The Horner Residence was a smaller Prairie styled home designed at the height of Wright's Prairie period. The cruciform floor plan is similar in footprint to the J. J. Walser (1903 - S.091), the George Barton Residence (1903 - S.103), and the K. C. DeRhodes Residence (1906 - S.125), but with modifications. A major difference was the grade of the first level. Like the DeRhodes, only the Entry / Reception Room was at ground level. The balance of the first level was five steps higher. This allowed utilities to be housed in the "basement" which was accessed by stairs next to the kitchen. At a glance the Horner Residence might be mistaken for the Thomas Gale (1904 - S.098) Residence. With it low pitched roof, it nearly appears flat, until seen at a distance. 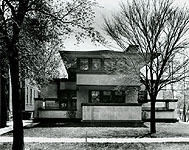 When Wright published "Ausgef�hrte Bauten und Entw�rfe von Frank Lloyd Wright" in 1910, he chose not to include the Horner Residence, but instead included an illustration and floor plan of the Barton (Plate XXVI), DeRhodes (Plate XXIX), and although not the same floor plan, the Gale (Plate XLV). 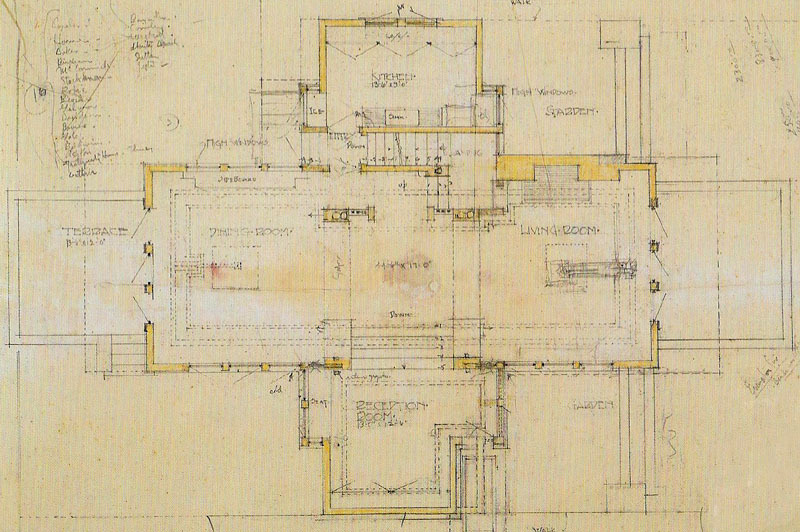 One year later Wright did included an exterior and interior photograph of the Horner Residence, and the floor plan for the first and second level in "Frank Lloyd Wright, Ausgef�hrte Bauten" (Executed Buildings), 1911 pages 62-63. 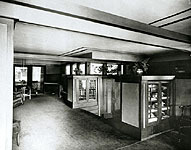 That same year Wright included the same two photographs and floor plan when he published "Frank Lloyd Wright, Chicago" (Sonderheft), 1911, pages 53-54. 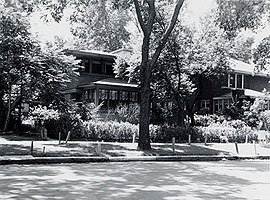 The Horner Residence is a smaller version of Wright's Prairie styled home but included many of the prairie styled features found in most of Wright's designed during that period. Broad overhangs, balconies, terraces, built-in planters, cabinets, furniture and seating, rich oak trim, distinct horizontal; and vertical lines, Wright designed art glass windows and light fixtures, large centrally located fireplace, vertical spindled screens enclosing the stairway. 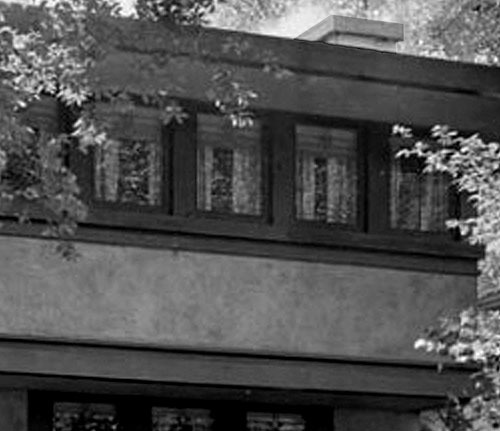 Wright chose wood and stucco for the exterior of the home. Samuel H. Horner was born on October 19, 1857 in Morrison, Illinois. He began his career as a "piano man", selling pianos in his home town. Lena J. Kent was born on October 22, 1864. Records indicate that Samuel and Lena were married in Whiteside County, Illinois, which included the town of Morrison. They moved to the big city, Chicago, where he became a piano salesman at Steger & Sons, Co. In 1893, at the age of 36 he took the plunge and started his own company, The Horner Piano Co. 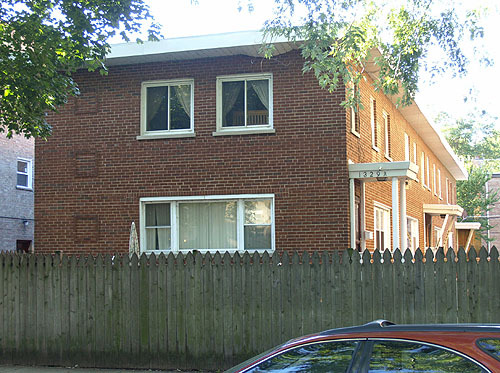 It was located at 549 West North Avenue. This was centrally located to some of Wright's clients at the time. This begs the question. With Wright's love of the piano, was this the connection that brought Frank Lloyd Wright and Samuel Horner together. John Lloyd Wright wrote, "It seemed to me in those days that he would rather have had six grand pianos and hold off the sheriff, than one fully paid without the sheriff." "My Father", page 77. In 1910, Samuel, Lena and A. Horner, Samuel's nephew. incorporated the Horner Piano Co. with a capital stock of $20,000, for the manufacture and sale of musical instruments and pianos. That is the equivalent of over $465,000 in 2010 dollars. At the time he was quoted that "for the present he would confine his attention to selling, but admitted that he may enter the manufacturing business a little later on". There is no evidence that they entered the manufacturing business. 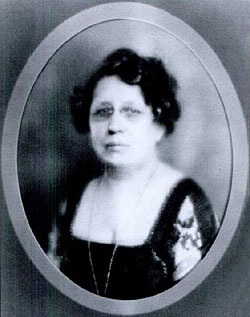 Mrs. Lena J. Horner. Courtesy of the Rogers Park Historical Society. daughter Hazel Beatrice Horner to Charles O. Hilton, who were married in their Wright designed home. "The house was decorated in autumn foliage and red and white roses." Lena was very active in the Rogers Park Women's Club as early as 1914. In 1917 she became president and served until 1919. "Lena K. Horner... was part of a fashion revolution with her daring d�colletage on full display; a daring dress with a mesh overlay. Her relaxed look would pave the way for the short hemlines and drop waists of the 1920s..."
During February, 1918 Samuel Horner became seriously ill, and was confirmed to his home for two months. During his illness, his son, Sam Hornton Jr. was in charge of the business. After recovering, it was announced in June of 1918 that he purchased his nephew's interest in the Horner Piano Company. His recover was not sustained, and on July 11, 1918, at the age of sixty, he passed away at his Wright designed home. He was buried in his home town of Morrison, Illinois. His obituary in The Music Trade Review reported, "Mr. Horner was one of the best known of the old-time piano men in Chicago." Horner's son-in-law Charles O. Hilton was promoted to vice-president and manager of the Horner Piano Co., but resigned in 1920 to take another position moving his family to Seattle then Baltimore. Lena continued to live in her Wright designed home for another seven years after her husbands death. But as the city expanded north, single family homes were replaced with apartments. Such was the case with Rogers Park. In June, 1925 she moved the Horner Piano Co. and her home ten miles north to Evanston, Illinois. She would continue to carry "pianos, player-pianos, reproducers and musical merchandise as well as radio equipment". Music Trade Review reported that Mrs. Samuel Horner, president of the Horner Piano Co., died on January 25, 1928 after a brief illness. Funeral services were held at her home in Evanston. 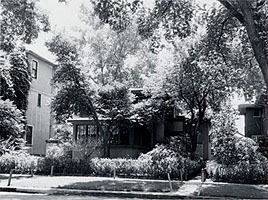 But by the time Gilman Lane photographed the home circa 1940, the adjacent home to the East had already been replaced by a large apartment complex. The front porch had also been enclosed. The city continued to grow, and just 44 years after Wright designed the home, it too was consumed by growth. Combined with a lack of appreciation for Wright's work, it was demolished to make room for a small non-descript apartment building. Original floor plan for the First level, 1908. As you walk through the front door you enter the Reception Room. The front door faced East in this original drawing, but faced the street (North) when the home was constructed. Built-in oak cabinets and seating lined the walls. Stairs lead up to the balance of the first level. Built-in book cases are on either side of the stairs. The Dining Room is on the left, the Living Room is on the right. A Sideboard is built-into the west wall of the Dining Room, high art glass windows above it. The large, prairie styled Fireplace is located in the Living Room, covering most of the west wall. Art glass doors lead out to a Terraces on either end. Vertical spindled screens enclose the stairway that leads to the second level and a doorway that leads to the Kitchen. Courtesy of "Frank Lloyd Wright Foundation. One year after Frank Lloyd Wright published his seminal "Ausgef�hrte Bauten und Entw�rfe von Frank Lloyd Wright" (S.87), he wrote and produced "Frank Lloyd Wright, Ausgef�hrte Bauten" (Executed Buildings). All in German, it was published by Ernst Wasmuth A.-G., Berlin in 1911. 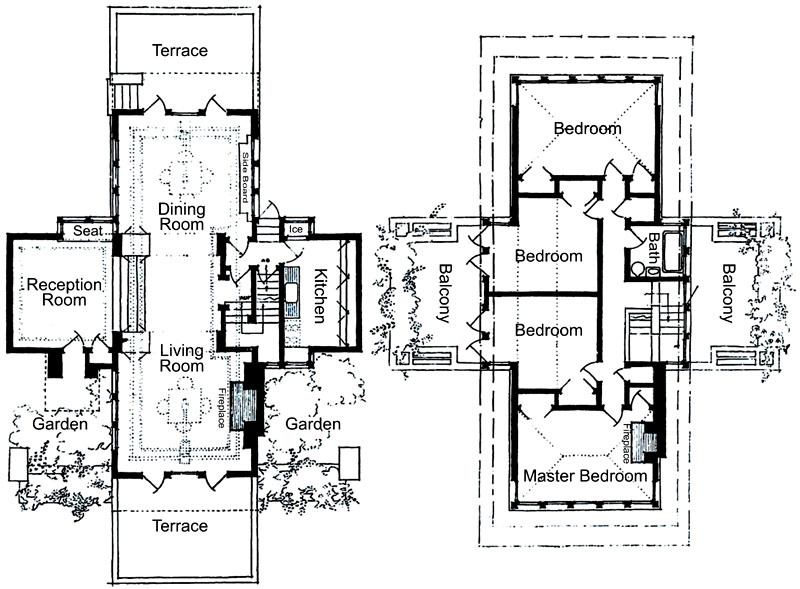 Wright included the floor plan of the Horner Residence for the first and second floors (page 63). That same year Wright included the same floor plan when he published "Frank Lloyd Wright, Chicago" (Sonderheft), 1911, pages 53. Floor plan for the First level, 1911. As you walk through the front door you enter the Reception Room. The front door, although hidden behind a garden wall, could be seen from the street (North). Built-in oak cabinets and seating lined the walls. Stairs lead up to the balance of the first level. Built-in book cases are on either side of the stairs. The Dining Room is on the left, the Living Room is on the right. A Sideboard is built-into the west wall of the Dining Room, high art glass windows above it. The large, prairie styled Fireplace is located in the Living Room, covering most of the west wall. Art glass doors lead out to a Terraces on either end. The second floor overhangs the Terrace, diminishing direct overhead sunlight. Vertical spindled screens enclose the stairway that leads to the second level and a doorway that leads to the Kitchen. Floor plan for the Second level. As you reach the top of the stairs, turn right to the exterior balcony over the Kitchen, with built-in Planters. Bedrooms and the Bath were reached by turning left at the top of the stairs. The Balcony on the east is reached through the two smaller Bedrooms. Courtesy of "Frank Lloyd Wright, Ausgef�hrte Bauten" (Executed Buildings), 1911. Modified by Douglas M. Steiner, copyright 2012. 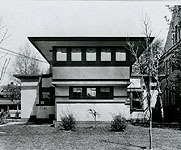 One year later Wright did included an exterior and interior photograph of the Horner Residence in "Frank Lloyd Wright, Ausgef�hrte Bauten" (Executed Buildings), 1911 pages 62. That same year Wright included the same two photographs when he published "Frank Lloyd Wright, Chicago" (Sonderheft), 1911, pages 54. Photographed by Henry Fuermann and published in "In The Nature of Material", Hitchcock, 1942. Hitchcock does not date this photograph but indicates in the Acknowledgments that Fuermann photographs were from his early work. Landscaping in front of the home has matured (3-5 years), but is very similar. The lot on the right, which was vacant in the 1910 photographs, has now been built. Courtesy of The Art Institute of Chicago. 1A) Front exterior viewed from the street, looking South. As you entered the sidewalk on the left, you passed the Garden Wall with it's pedestal that begged for a urn. A large prairie styled Robie House urn would have fit perfectly. Turning right into the Garden, you entered the home through the front door. The Reception Room is on the left. Five wide stairs lead up to the balance of the first level. The Living Room is in the center foreground with art glass doors that exit out to an enclosed Terrace. The symmetrical Garden Wall on the far right. Upper level. As you reached the top of the stairs, the Bedrooms and the Bath were reached by turning left. 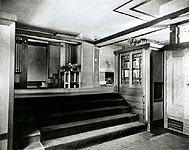 The Balcony on the east (left) above the Reception Room was reached through the two smaller Bedrooms in the center of the upper level. A row of art glass windows were just beneath the roof line of the Master Bedroom in the center. The Balconies had built-in Planters on either end. The low pitch of the roof almost gives the appearance of being flat like the Gale Residence. Photographed by Henry Fuermann. Courtesy of The Art Institute of Chicago. 1B) Turning right into the Garden, you entered the home through the front door and step into the Reception Room. Two art glass windows are directly above. Five wide stairs lead up to the balance of the first level. The three windows on the right add light to the Living Room. 1C) A row of art glass windows were just beneath the roof line of the Master Bedroom. Five across the front, one on either side. 1D) From the Living Room, art glass doors exit out to an enclosed Terrace. 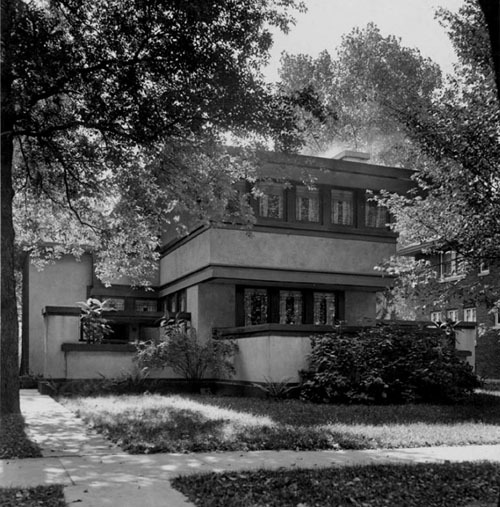 Gilman Lane photographed building in the Chicago area including many of Wright�s work. Upon his death in 1961, Lane donated his collection of over 700 photographs to the Oak Park Public Library. 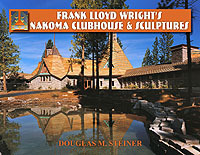 He left an early record of over 150 Wright buildings. In the seminal Biography of Wright's Work by Henry-Russell Hitchcock, "The Nature of Materials", Hitchcock credits Henry Fuermann and Sons, and "another important group of photographs taken by Gilman Lane... who has been photographing Wright's work for many years..."
These three photographs are not dated but most likely photographed during the late 1930s to early 1940s. The front Terrace was enclosed, and the landscaping has matured. 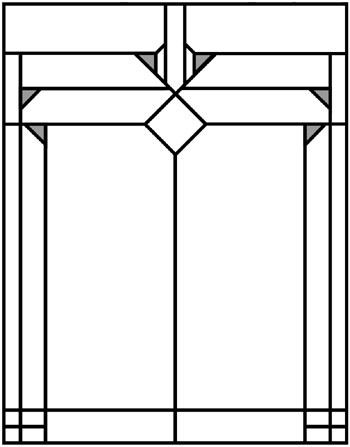 The Horner art glass doors and windows were simple, geometric and symmetrical in design. They were executed in clear glass with a small triangle in color. There were three basic sizes; doors on the first and second level, high windows on the first level and the bedroom windows on the second level. All opened outward. Besides the front and back doors, the Living and Dining Rooms each had three doors that opened out to the front and back terraces. Each of the small bedrooms upstairs had a double set of doors that opened out to the balcony on the east side, and the hall at the top of the stairs had a door that opened out to the balcony on the west side. 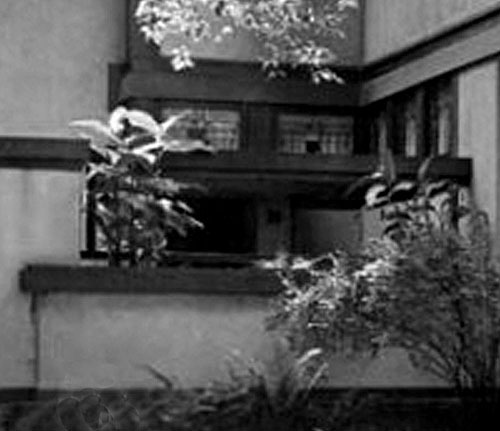 Wright labeled the smaller windows on the first level "high windows". These aligned with the top of the doors, allowed light into the rooms, but gave privacy from the outside world. There were two above the front door and three on the east side of the Living Room. They also appeared in the kitchen, three above the sideboard in the Dining Room, as well as three on the opposite wall of the Dining Room. The larger windows appeared in rows just beneath the roof line of the second floor. Illustrations adapted by Douglas M. Steiner. Doors: Besides the front and back doors, the Living and Dining Rooms each had three doors that opened out to the front and back terraces. Each of the small bedrooms upstairs had a double set of doors that opened out to the balcony on the east side, and the hall at the top of the stairs had a door that opened out to the balcony on the west side. 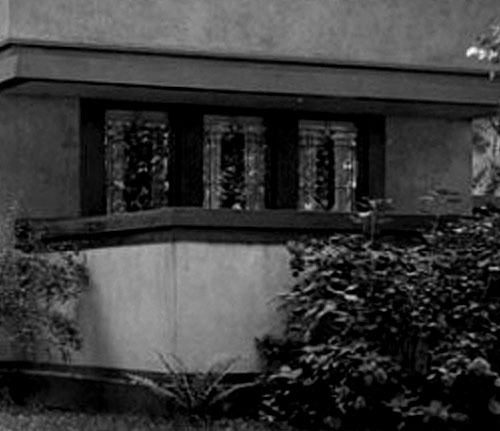 High Windows: Wright labeled the smaller windows on the first level "high windows". These aligned with the top of the doors, allowed light into the rooms, but gave privacy from the outside world. There were two above the front door and three on the east side of the Living Room. They also appeared in the kitchen, three above the sideboard in the Dining Room, as well as three on the opposite wall of the Dining Room. 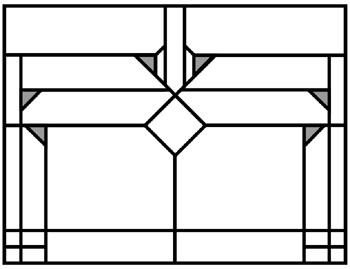 Large Windows: The larger windows appeared in rows just beneath the roof line of the second floor. At the turn of the century, Rogers Park was a northern community, considered "out in the country". Today, it is hard to imagine passing farms as you headed North from downtown Chicago. In 1900, the Northwestern Elevated Railroad ended at Wilson Avenue, just a few blocks West of Lincoln Park. Farms could still be seen from the elevated platform. To describe the city as exploding northward could be considered an understatement. When the Horners built their home in 1908, the population of Rogers Park was under 10,000. When Mrs. Horner moved from her home in 1925 the population of Rogers Park had past 50,000, making it one of the most densely populated areas in Chicago. The city continued to grow, and just 44 years after Wright designed the home, it too was consumed by growth. Combined with a lack of appreciation for Wright's work, it was demolished to make room for a small non-descript apartment building. The Horner property today. Courtesy of Cook County 2009. "Music Trade Review", May 18, 1910, page 91. "Frank Lloyd Wright, Ausgef�hrte Bauten", Wright, 1911, pages 62-63. "Frank Lloyd Wright, Chicago" (Sonderheft), Wright, 1911, pages 53-54. "The Lake Shore News", October 31, 1912, page 15. "Music Trade Review", April 6, 1918, page 34. "Music Trade Review", June 29, 1918, page 37. "Music Trade Review", July 13, 1918, page 31. "Printer's Ink", November 18, page 130. "Music Trade Review", July 18, 1925, page 30. "Music Trade Review", January 1928, page 15. "In The Nature of Material", Hitchcock, 1942, plate 136. "﻿My Father Who is on Earth", 1946, Wright, page 77. "The Frank Lloyd Wright Companion", Storrer, 1993, page 143. "Lost Wright" Lind, 1996, pages 39, 56-57. "Frank Lloyd Wright, Complete Works 1885-1916", Pfeiffer: Gossel, 2011, pages 317.